WITH DIRECT DEPOSIT, YOUR PAYMENT CAN BE WORRY-FREE! Accounts Payable can pay vendor invoices and employee expense/travel reimbursements through Direct Deposit (or ACH), similar to the direct deposit for Payroll. You can click here to go directly to the Direct Deposit Authorization Form for non-Traineeship payments or read-on for more information. IMPORTANT NOTICE FOR UNIVERSITY EMPLOYEES: If you are already setup for Direct Deposit through Payroll be sure to read the important discussion below regarding the differences between Payroll’s multiple account distribution option and Accounts Payable Direct Deposit restrictions. Peace of Mind – No worries about mail delays or having checks lost or stolen. Prompt Payment – The deposit is credited on the next business day before they are due. For example, if we notify you today that we will deposit a payment, refund, or reimbursement into your checking account, it would be in your bank account the following morning. Our Friday business is credited on Monday, as long as Monday is not a banking holiday. Convenience – No special trips to pick up and deposit checks. Freedom – Payments are automatically deposited to your account, even if you are traveling, on vacation or ill.
Any transaction dated on or after the date of change will be paid as instructed on the new form. Any transaction with an invoice date prior to the date of change will be paid by the previous payment method. When do direct deposit funds become available? Funds should become available in your bank account on the business day after you are notified of the payment. Please contact your bank directly if your funds are not available. Can my Direct Deposit can be split up amongst multiple accounts? Your funds can only be deposited into one account. Accounts Payable cannot split the payment among several accounts as Payroll permits, because these are commercial transactions governed by different banking rules. Contact your bank to discuss automatic transfers into other accounts. Can Direct Deposit be made to out of state financial institutions? 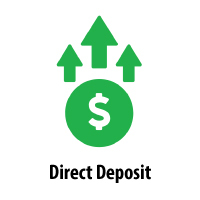 Yes, Direct Deposit can be made to any financial institution within the United States. Is Direct Deposit available for recurring Traineeship payments? Yes. Click on ‘Instructions’ below. How will I be notified that the University has prepared a Direct Deposit payment on my behalf? Important Notice: A ‘csv’ file is not an Excel file. It is a very old text file format that predates Excel, yet the program can read and display the contents as though it were in native Excel format. The file can also be opened by any text editor like Notepad, NoteTab, or Wordpad. CSV formatted files are not known to carry any form of virus, malware, or spyware.